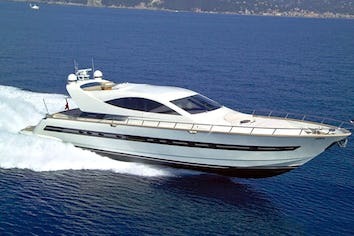 Sheer power and sleek lines distinguish Aspire of London, Sunseeker Predator 72’. Professional Aspire's Owner uses to make annualy routine maquillage refits like new tapestries and covers but also very important refits like closing and renewal of the galley, the remaking of entire parts of the deck like the stern accommodations, the transformation of some cabins, the replacement of whole equipment. So during the years 2014, 2015 and 2016, Aspire of London has undergone great changes aimed at improving her use and comfort. The main of these has been on the exterios comprising the expansion of the aft sundeck with the renovation of the entire transom so to give more room to the cockpit and a more spacious sunbed; in the interiors the galley has been closed so to give more privacy to guests cabins hall and a new freezer and a new oven have been installed as well as a new Kohler generator. Aspire of London can cruise with up to 12 guests during the day and accommodates up to 8 guests overnight in 4 cabins, 1 Master, 1 Vip with ensuite facilities, 1 twin and 1 pullman bunk cabin, sharing the ensuite. 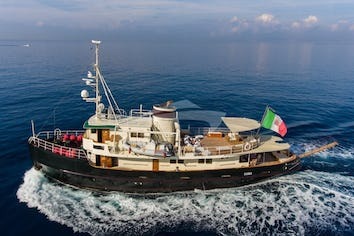 She is ideal for cruising the coast , islands and inslets surrounding the Costa Smeralda, South of Sardinia, and Corsica. Her italian english speaking Captain Cristian Arena leads a crew of 2 composed by himself and his excellent second mate/cook Giulio Cabras, both Sardinia born. 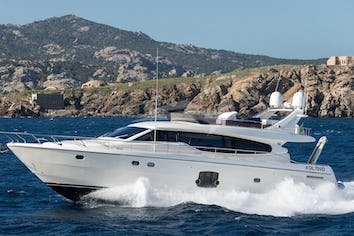 The two will offer all their knowledge and professionality to guests who will enjoy an oustanding vacation sharing the best of what Sardinia, Costa Smeralda, the Archipelago of la Maddalena and Corsica can, offer being this either a touristic elegant family trip or a jet set luxury vacation. 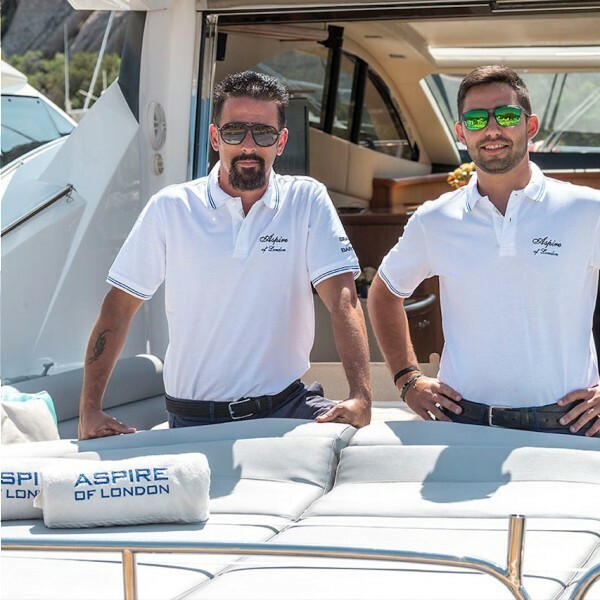 ASPIRE OF LONDON can accommodate 8 guests in 4 cabins and three en suites: one Master cabin with a king size bed, shower and toilet; a VIP cabin with a queen size bed, shower and toilet; a twin cabin with two single beds and a pullman cabin (these two cabins share the same toilet with shower). ASPIRE OF LONDON is fully air conditioned through out. Crew has a separate heads and shower. Embarks: from 1997 to 2004 he was emarked in passengers ships as a sailor and Chef; from 2004 to 2008 helsman officer in american militar passenger ships in La Maddalena; from 2009 to 2010 he was Captain on italian passenger ships; from 2010 to 2017 he worked on various charter yachts as a Captain in Sardinia & Corsica with the Company Poltu Quatu Charter. Cristian experience is of more than twenty years and during these years he acquired a deep knoledge of pleasure and charter yachts. He is an expert sailor with a great knowledge of this charter area (Sardinia and Corsica) and he is a serious and trustable Captain, scrupulous and prepared. Cristian is a direct and gentle young man and he knows how to pamper clients from whom he always deserves esteem and affection. Spoken Languages: italian (mother tongue), english (fluent). Education: High School license and nautical license in the Nautica Institute of La Maddalena, Sardinia. Giulio is a young and brilliant sailor of La Maddalena, who has been attending the sea and the boats since being a little boy becoming a real sailor expert. He graduated from La Maddalena's Naval Institute and during the school years also attended specialization courses. After graduation he embarked on board as an official sailor to become an officer. During the summer seasons he used to sail on both motor and sailing boats of the Starwood Hotel Company encharged of the galley and as a sailor on Maddalena's tourist and charter local boats. Giulio has a good knowledge of English. His sea experience and his passion for cooking make him a great crew member deck-hand. Giulio is a really passionate and excellent amateur Chef, able to cook special dishes from the recepies of his Sardinian region and he is also excellent on fish and shellfish cooking. Giulio is also a very sportive guy and apart from the love for the sea and all the other sports involving sails, he has played football for 3 years in the Maddalena football club and played basket too for the local sardinian club. With a sunny character and always a smile on his face, an excellent education and preparation in the nautical field he is ready for any task or request. Giulio in a very short time has deserved the esteem and sympathy of everybody becoming a trustable element on the co-handling of the boat with the Captain and of full satisfaction of the owner and guests. Having deep human warmth, Giulio is always helpful and attentive to all our client's requirements.